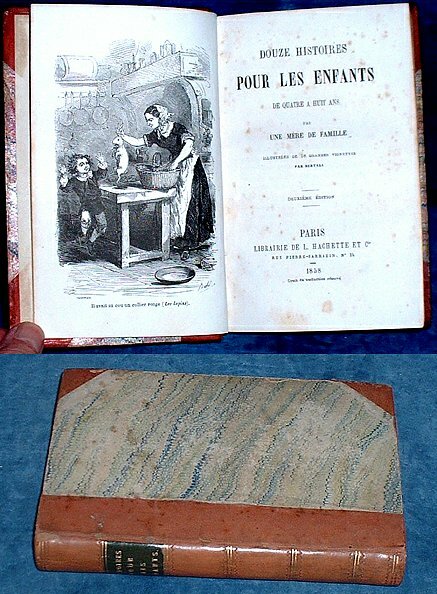 Description: Paris, L. Hachette et Cie 2nd edition 1858 Wood-engraved plates (18 full page) by Bertall (1820-1882). . 165x102mm brown half leather spine gilt rules with black gilt title label marbled covers (edges shelf rubbed) frontis + titlepage + ii + 251pp + pp blanks & contents index. One page with ink page number to margin as it seems to have been misbound and some pale foxing to a few pages but mostly clean, tight and supple throughout. *Eighteen lively full-page illustrations.